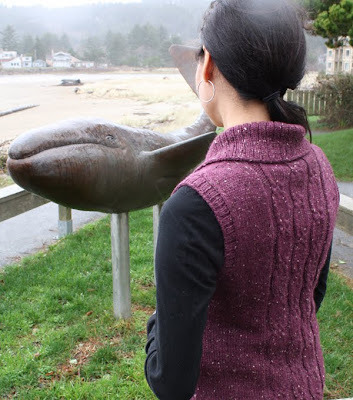 Feel at ease in Adagio, a fitted tunic vest in a luxurious blend of Merino and Alpaca. The braided cables in the center panel are graceful and elongating. The drapey cowl keeps you warm while creating a lovely frame for your neck and face. 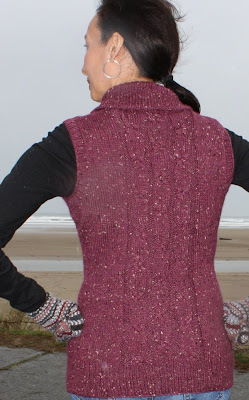 Adagio, in Knit Pick's City Tweed, is rustic when layered for a rainy afternoon at the beach. It is refined when worn on its own as a sleeveless shell. 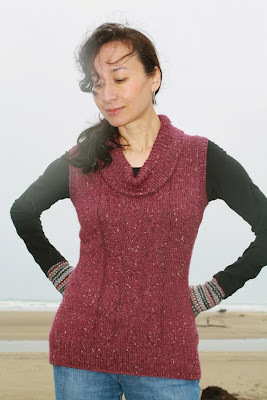 Versatile, simple, elegant, Adagio is relaxing to knit and to wear. 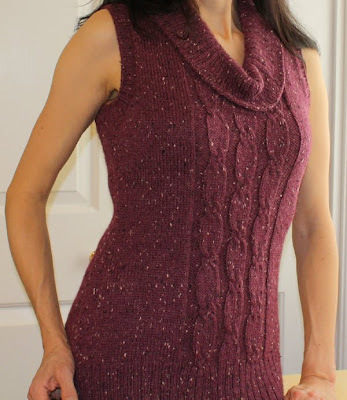 Adagio is worked in the round from hem to armhole, then separated at the yoke and worked in rows. The shoulders are joined with a 3-needle bind off. Cowl collar and armbands are picked up and knit in the round. There are no seams to sew in this tunic. You may also purchase a copy through Knit Picks. Choose a size that will give you from 0 to 3"/7.5 cm positive ease. Sample shown is worn with about 1"/2.5 cm positive ease. Gauge: 22 st and 28 rws over 4"/10 cm in ST st. Center panel is 6.25"/15.5 cm for sizes 32 through 40, and 8"/20.5 cm for sizes 42 through 46. Yarn: Knit Picks City Tweed DK, 7 (8, 8, 8, 9, 9, 10, 10) skeins in Plum Wine, 55% Merino wool, 25% superfine Alpaca, 20% Donegal tweed. I recommend buying 1 extra skein to accommodate gauge differences and swatching. Needles: US 5/3.75 mm and US 7/4.5 mm, 24" and 16" circulars, US 6/4 mm, 16" circulars. You will need a third needle in US 7/4.5 mm to work the 3-needle bind off. If needed, change needle size to get gauge. * The buy now button will take you to PayPal. After entering your payment information, you'll receive an e-mail with a download link, or if you're a ravelry.com member, the pattern will be placed in your library. Click image below for larger view of schematics.